Starbucks To Offer Mobile Ordering App for Android? Starbucks has claimed it offered the first mobile app for iPhone users - a notification that displayed the name of the song playing inside their stores - and now it just might be the first major American restauranteur to offer mobile ordering. In an interview with PCWorld, McLarsen - head of mobile and emerging platforms at Starbucks - revealed that the company is debating how to create a mobile ordering app that doesn't annoy other people in line at the store. "It could encourage some people to buy a drink when they'd otherwise walk away because of a long line, but it could also annoy people who are waiting in line when they see people head to the front of the line to pick up a pre-ordered drink", McLarsen said in the article. People might order a drink from their phone but arrive to the store late and complain that their drink is cold. "We'll try something with it. Stay tuned," he said. 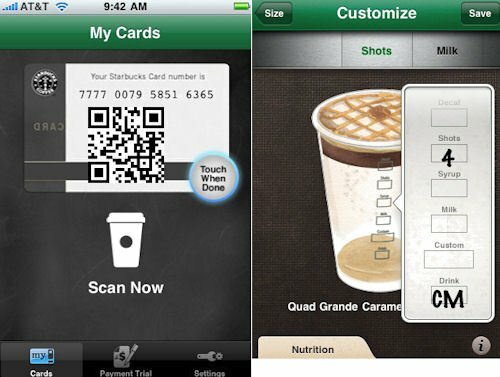 Currently Starbucks offers mobile apps to iPhone and BlackBerry users, which allows customers to pay for their frappuccino addictions directly on their phones. At the very least, the Android app will allow users the same. I'm surprised nobody has pointed to the My Coffee Card app by birbeck. It generates a bar code for payment, calls up transactions, reloads a card and tells how many stars you have earned on your registered card! When that app showed up there was no need for an official app. The app that I had before that was the best I found in the market just disappeared it was so outclassed. "It could encourage some people to buy a drink when they'd otherwise walk away because of a long line, but it could also annoy people who are waiting in line." I agree: could be annoying!